Mrs. Mary Hemphill, one of the best known and most beloved women of Murray County, died Wednesday, and was buried Thursday afternoon at 2 o’clock at the family burying ground. Mrs. Hemphill lived in Chatsworth for several years, making her home with her son, Mr. J. A. Hemphill. Her many friends are saddened by her death. This article was originally published in The Chatsworth Times on Thursday, July 7, 1921. Source: Hemphill Scrapbook; privately held by D. H. Davis, [ADDRESS FOR PRIVATE USE,] , D. H. Davis, “Mrs. 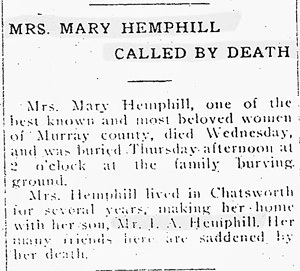 Mary Hemphill Called By Death”, 07 Jul 1921, The Chatsworth Times, 13 Jul 2009. Another terrific post!! I am having no luck finding any obituaries or death notices in Newspapers for my ancestors. I don’t live in the states where I need to search, so I am relying for online info… Do you have any suggestions for me? Thanks for being such a great source of info! If your ancestors lived in larger cities, you may be able to find newspapers on microfilm at a library. Newspaper Archive.com and Genealogy Bank both have newspapers online. Footnote also has some newspapers. I’ve never had any luck with either Newspaper Archive or Genealogy Bank, because my ancestors all lived in rural areas and they don’t have any of the area papers online (yet). I have found a few good things in The Atlanta Constitution, which Footnote has – these were bigger stories that captured the interest of the Atlanta paper. For example, my great-grandmother’s brother died in Guantanomo during the Spanish-American war and his name was listed in the AC.